Visalia, California is an agricultural city in California's San Joaquin Valley, and was served by both Southern Pacific and Atchison, Topeka & Santa Fe branches (today Union Pacific and BNSF, respectively). 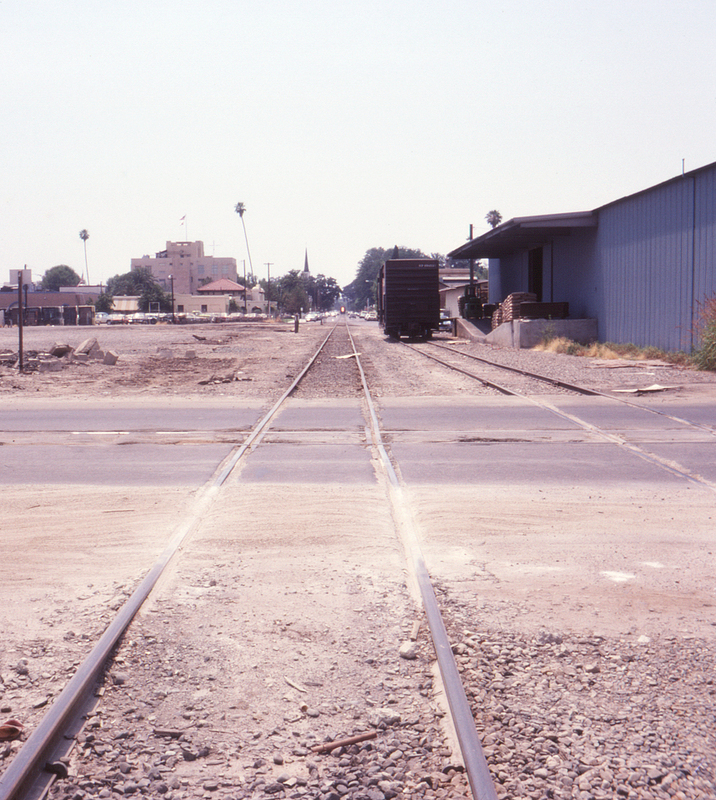 The Southern Pacific line seen here in downtown Visalia was formerly part of the Visalia Electric system, an SP subsidiary; in the distance the tracks can be seen running down the center of East Oak Ave in this view looking west. The large building to the left of the tracks is the Tulare County Courthouse. The empty lot at left marks the former location of the Southern Pacific's station. In the foreground is North Santa Fe Street; not surprisingly, the tracks embedded in the pavement and crossing the SP at grade belong to the Santa Fe, which at the time ran down Santa Fe Street through most of the city.